The Indian Passenger Vehicle market which became the fourth largest in the world in 2018 by surpassing Germany is well poised to become the third largest automotive market by 2022. As a relatively new entrant in the Indian automobile market, Renault India crossed the 5,00,000 sales milestone last year, becoming one of the fastest automobile brands in India to achieve this accomplishment. India is a strategic market for Groupe Renault and the company has a clear ‘India strategy’ for the success of Renault’s medium-term plan. 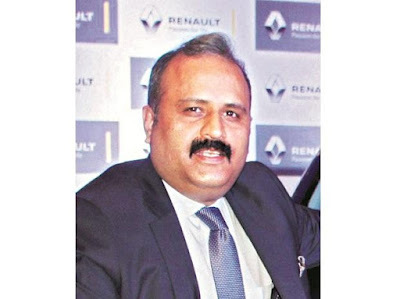 Renault also announced Mr. Venkatram Mamillapalle as its new Country CEO & Managing He comes with over 28 years of automotive experience and will spearhead Renault’s operations in India and SAARC countries. Prior to this, Venkatram was the head of Renault-Nissan-AVTOVAZ in Russia where he was part of a major transition, steering growth and profitability for the company. Before joining Groupe Renault, Venkatram has held several leading positions with various Indian and global OEM’s. Venkatram brings with him vast knowledge of the Indian automotive landscape including supply chain management, quality, manufacturing and logistics which will enable the company to implement a comprehensive expansion for Renault in India. He has also been part of the Executive Committee, Board and International Boards of his previous companies. Renault is also readying for a new product launch this year, which will be a true game changer. With SUVs being Renault’s forte and the fastest growing segment in India, the product-offensive strategy will revolve around leveraging this strength, whilst catering to the growing segments to meet the evolving needs and preferences of the diversified Indian customers and create new segments and sub-segments in the Indian automotive industry. Renault’s upcoming products will be designed, engineered, developed and manufactured in India, for India. Renault will also lay equal emphasis and focus to make dealer partners profitable, which in turn will lead to Renault's turnaround, by increasing the volume and offerings. With a 120 year global heritage, Renault is part of the world’s largest automotive alliance. Renault has made heavy investments towards getting the basics right and thereby creating a strong foundation for Renault in India. These include a state-of-the-art manufacturing plant in Chennai (4,80,000 units annual capacity), a world-class technology centre, two design centres of global repute and 2 world-class logistics centres. Although Renault currently has a restricted coverage of the Indian automotive market with its current portfolio covering less than 40% of the market, Renault is the number 1 European automotive brand in India and has a clear product strategy to cater to newer and growing segments of India’s automotive market. The Indian automobile market offers tremendous growth opportunities led by lower car penetration and favorable customer demographics with rising disposable incomes, and Renault is well poised to shape the future of this growth.